Just a few days ago, I was discussing our plans to grow our side income next year (2018) so that we can help fund my wife’s IRA account. Well based on our November results, I am encouraged about the potential to earn blogging income as a side hustle. When it comes to blogging, I have 2 passions – personal finance and health and fitness. I handle the personal finance side of things here on The Money Sprout. For covering health and fitness topics … I started a separate blog for that over 3 years ago. Now my focus has changed from blogging as a hobby to blogging as a source of side income. To date, visitors to the health and fitness blog have been limited and there have been no earnings. Instead of earning any income, the site has incurred several expenses including – domain name, hosting, and WordPress theme costs. So overall, my heath and fitness site has been cash flow negative since it first started. The goal we set earlier this year was to earn $5,000 per month in sustainable income by June 2018 from this niche site. Each month I provide an update on our progress … so here are the updates from November (2017). No … that 37,000+ pageviews up from 4,000+ last month is not a typo. My pageviews actually increased by over 800%! Why so much growth? All of those pageviews came from the growth of my site’s Pinterest account. I have not been actively posting new content to this site, but I have been growing it’s Pinterest account. And as a result, our pageview growth exploded. Even though I didn’t work too much on the blog directly last month … we did grow our Pinterest account and got a big jump in traffic. I didn’t do very much to grow our Twitter account in November and even less with Instagram. However, we still managed to grow the number of Twitter followers despite not spending any time there. For now … it is all about mastering Pinterest as that gives us the biggest return right now. 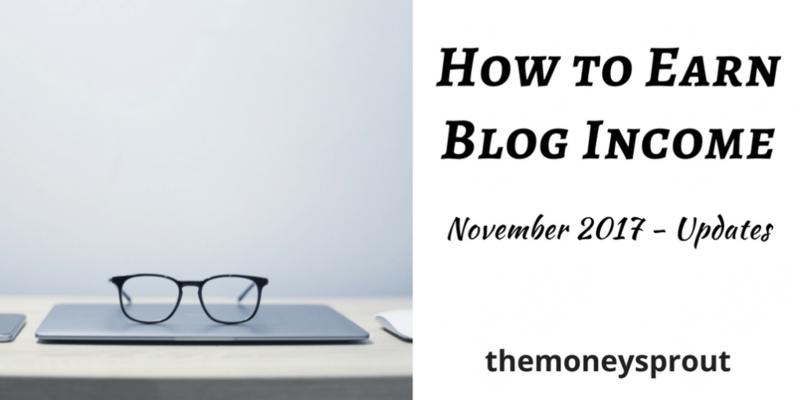 Blogging Income Results for November – How did we do? We didn’t spend a lot of time (again) on publishing new content on the site. However, that doesn’t mean it wasn’t a successful month. In fact … the results from last month have really given me a good feeling we may be on to something that is sustainable. Nope … didn’t come close to hitting this. We actually posted 2 new articles that were over 2,000 words each. It seems that whenever I start writing content for the site, my goal for a 1,000 word post turn into more and more words. So instead of writing a bunch of smaller posts … I write fewer longer posts. This isn’t necessarily a bad thing … I guess. As you can see from the Pinterest followers noted above … we really grew this social media account last month. I am really starting to see huge returns from Pinterest. I realize we don’t want to put all our eggs in one basket … but there is no better way to explode your traffic right now other than Pinterest. We have also been leveraging our Tailwind account (which I highly recommend). I spend about 20 minutes per day now in our Tailwind account scheduling pins. And you may be surprised … but 99% of the pins we schedule are not from our niche site. I plan to write future post(s) about growing a Pinterest account … but for now just know that it can really help push traffic to your site … at least in the short-term. I have been getting carried away with setting goals on publishing new posts. So in December, I want to try and set a goal that will be sustainable. At the same time, I want to continue growing our Pinterest account so we can push past 30,000 pageviews and hit 100,000! One last thing … for several months I had been posting that I couldn’t seem to get any email subscribers. Well in October, we got our 1st email subscriber and in November we added 11 more. I hope to continue this trend of adding subscribers in December. After seeing our pageviews explode last month, I am very encouraged about getting traffic to our niche site. As long as I can dedicate time to producing new content on the site, I know Pinterest can drive traffic to the blog.